ReStore find. Interesting that Philips makes their own, for many years they were only made by Sylvania. GE sourced in theirs from Sylvania initially, now GE gets them from China. Although the Philips U bents with the 6 inch leg spacing still feature the Westinghouse structure at the bend, the 1 5/8 inch version seems to have the Philips style bend. It still doesn't have guards and it has a Westy style metal bar between the end caps. 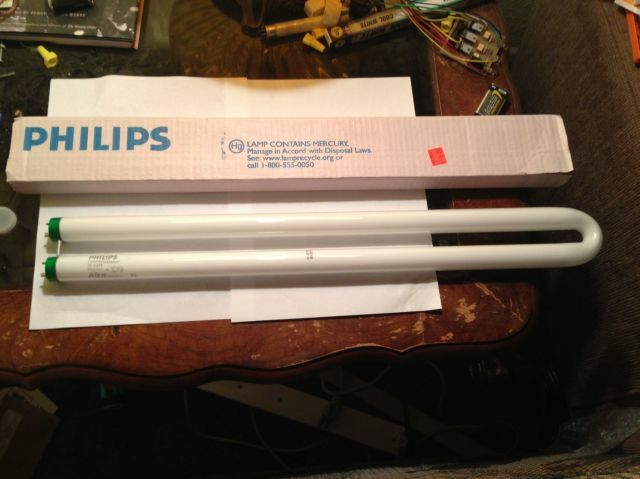 Note that this lamp is a 29w energy saver, they are normally 31w. The /EW suffix in the ordering code, meaning Econ-o-watt, is present but Philips has largely changed to the Energy Advantage name. So is this a alto? 29W sounds odd. Bet it would run ok on a EC36 SS choke! I used to see the Sylvania Octron 3500K version of this at our local Burger King until they tore that restaurant down and built a new one. Now, I think they use 17T8 lamps but can't be sure as the lamps are covered by a diffuser in the center of the fixture.